Green Plumbing Examples: sewer, leaks, water quality. "Doing it right, so we both can sleep at night"
It's True! Ocean Plumbing does your plumbing green and right - so we both can sleep at night! This requires several days a year in special schooling to help us learn the newest green methods. That we like! On-going, State Approved Training teaches us how to plumb with lower negative impact, limiting damage to the earth and water resources. All plumbers receive green training. We added 3 more to it that benefits you personally. A new 3-point sewer cleaning technique that avoids digging up your yard when you have a sewer drain backup. Add our ten year experience with water heaters - We know the best to recommend - a green advantage. And, we know the best green water filtering, "alkaline" producing systems. - Ours choice is green because it filters and provides better health for the whole family. Talk directly to a plumber NOW! 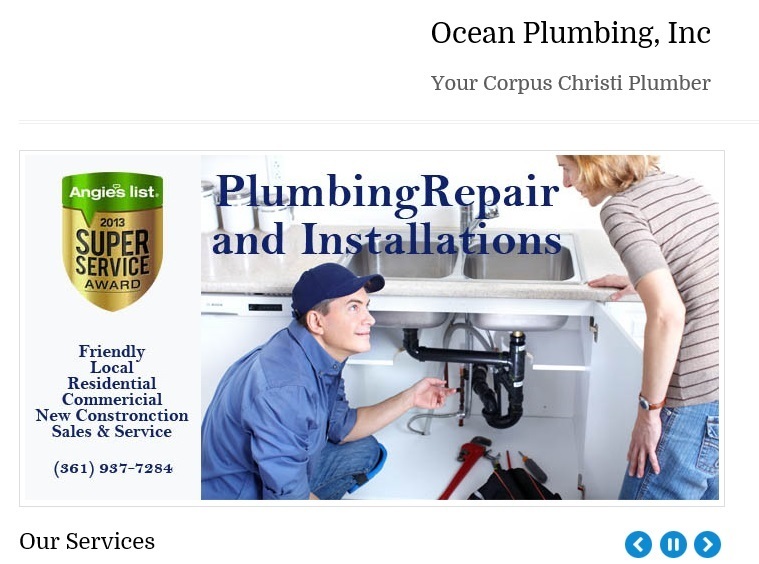 Call Ocean Plumbing at 1-361-937-7284. To locate your backup or leak problem you can watch with us on a laptop our special live-camera, snaking its way in your sewer pipe, checking every inch of your house and yard sewer system – all the way to the street. You can plainly see – the problem area appear as the damage or blockage appears. If it’s a clog, or choke-closed dirty pipe, you can actually see our Power-jet Cleaning tool fitted next to the camera slice up and wash to the street main line debris or roots-causing the clog. Pretty neet and very green. Right? Then, you watch as we clean the entire sewer pipe from end to end, amazingly as clean as new. Our method ends your sewer problem for good. What about a broken pipe Problem? If it’s a damaged, or collapsed section causing the problem, the camera shows this also. Now, you know what needs fixing. At the place of damage, the Camera will send out a beep from deep in the pipe. The beep is picked up above ground by our hand-held beep receiver. This tells us exactly where to dig up to fix the problem. So very little disruption is done to your yard. You can see how Ocean Plumbing Green technology saves you time, reduces avoidable expense, and keeps from tearing up your whole house or yard to fix your problem. Those are important "Green technology skills” Ocean Plumbing uses to your advantage.... and so are these. Water heater old, acting up? We will show you 3 of the best, easy-to-maintain water heaters we found. We know, from 10 years of installing water heaters, which really are the top 3 best energy-saving, noise-free, water-heaters to use. Those we found to be best energy-saving, noise-free, give long, trouble-free life. That information is worth a lot to you when you depend on a plumber with that experience helping you. This includes tank-less systems now in the news. There are different brands, but one brand is truly better. And, there are 3 systems. We can show you which is right for your needs and budget. Hate your old, slow, water-wasting toilet? The same green plumbing examples and knowledge is true when advising about the variety of toilets being sold. We know which are the best, trouble-free, lo-volume-flushing toilets to use to replace you old water-wasting ones with. Hate your ugly, leaky facets? Every day, we are replacing old, leaky facets with new, durable, and beautiful facets for the kitchen sinks, bathrooms and bars. Better health is not what a water filter provides! Why Not? It has to do with acidity. I'll explain that after this point. Some water piped into the house needs filtering. Here are the types. Whole house, cold side only, just at the sink type. We will show you those 3 easy-to-maintain water purifiers. Whole house type, cold side only, just at the sink type. We know these systems and can advise you on what’s best for your need. Your piped-in water can now be processed into a health improving water at you kitchen sink. That is one more Green Plumbing Example for you and your families ultimate good health. You can now enjoy the healthy advantages of drinking "alkaline pure drinking water." We recommend the original brand. By the inventor. Not a cheap knockoff. The brand chosen by hundreds of hospitals. It is the inventors brand from Japan. Try it for a month on us - you won't give it back. We finance. Home and commercial units. Ask us about them to day! Be healthier, tomorrow. This type Green puts your family's health and vitality on track. High Alkalinity of water ends body acidity, a common cause of sickness, and the lack of feeling good. The type of green care may turn your life around to healthy in just 6 weeks. Call us to learn more. Your new home can have the new, long-life, "flexible piping" and lo-water-volume shower and flush systems. This new system reduces up to 30% in parts cost, and water saving - compared to conventional systems commonly used. Ever see our trucks around? Our trucks all rate great fuel economy and lo-emissions. [Thanks to my Dad who treats en all with a special anti-wear, oil and fuel additive he sells, called, Mega Power. "Thanks again for greening all our vehicles and heavy equipment." He's an expert on total green vehicle care. Call him for literature on such, to see what you need to go vehicle and equipment green. Call him - George Christ, at 512 6656 3388 for his help on that. Back to a point about our trucks. They are stocked so we don't have to leave the job to chase parts - which also lowers your invoice billing time, ends your plumbing headache faster, and is a green-thing - in its own little way for us - and you. An, Eco-Friendly-Plumber Have an Emergency? We can be there in about 60 minutes, or so. Ocean Plumbing uses the best Eco-Friendly Products and Techniques. WE Preach: "Be Eco-Friendly! "A 24 hour standby crew awaits your call. All trucks carry emergency parts. We are Friendly, Helpful, Give Advice Gladly and Freely. At your place, or by Phone. Bids are Free!